WASHINGTON, DC, November 1, 2010 (ENS) – Fifty-four high-speed rail projects in 23 states will share in $2.4 billion to continue developing America’s first nationwide program of high-speed intercity passenger rail service, U.S. Transportation Secretary Ray LaHood announced Thursday. While $2.3 billion is a substantial chunk of cash, the demand for funding was even greater. The Federal Railroad Administration received 132 grant applications from 32 states totaling $8.8 billion, more than three times the amount available. During the first round of awards in the fall of 2009, applicants submitted more than $55 billion in project proposals for the initial $8 billion from the American Recovery and Reinvestment Act. More than 30 rail manufacturers and suppliers, both domestic and foreign, have agreed to establish or expand their bases of operations in the United States if they are hired to build America’s next generation high-speed lines, a commitment the Obama administration secured to help ensure new jobs are created in the United States. California received the largest amount in this latest outlay of federal funds, more than $901 million, including $715 million for the construction of new high-speed rail lines in the Central Valley. In January, California received $2.25 billion from the American Recovery and Reinvestment Act for high-speed intercity rail systems – also the largest award for high-speed train funding of any state in that distribution – for a total of more than $3 billion. “The state has made significant investments in passenger rail that have led to remarkable ridership growth,” said LaHood. However, the California High Speed Rail Authority “is not fully prepared” to distribute and monitor American Recovery and Reinvestment Act, ARRA, funds, according to an October 27 report from the State of California Office of Inspector General. 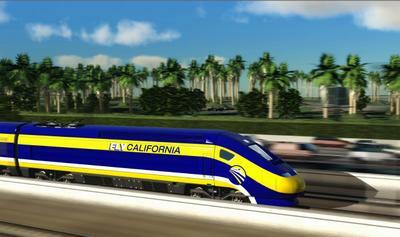 IG Laura Chick wrote in her report, “Currently, the Authority does not have funding plans approved by the Director of Finance as required by Proposition lA, which would be used to match ARRA.” Proposition 1A is a bond funding measure for high-speed rail approved by California voters in November 2008. These lacks have caused the Authority to pay out $3.44 million (38 percent) in expenditures, out of $8.94 million reviewed, “without obtaining adequate supporting documents,” Chick wrote. Yet, Chick gave the Authority credit for making “significant progress” on the majority of the recommendations included in a Bureau of State Audits April 2010 report, in a relatively short period of time. Florida received $800 million for the Tampa to Orlando high-speed rail corridor. The state’s long-term vision is for a high-speed rail line that connects Tampa, Orlando, Miami and other communities. The $800 million will underwrite construction of 84 miles of dedicated high-speed rail tracks and purchase of new train sets that will make 16 daily roundtrips at speeds reaching 168 miles per hour. The Chicago-to-Iowa City GreenLine passenger rail route – with service to commence in 2015 – will provide two daily round trips and carry trains traveling at speeds up to 79 mph, with an expected trip time of less than five hours on the 219.5-mile route. Michigan received $161 million for a high-speed rail corridor connecting Detroit and Chicago, the two largest cities in the Midwest. The long-term vision for this corridor includes doubling the number of daily round trips between Detroit and Chicago. The money is being awarded for a range of activities, such as construction of track and stations, purchase of new passenger equipment, and planning studies to develop new high-speed rail service. In addition to the $8 billion down payment from the Recovery Act, additional funding for high-speed rail has come from several sources. These include $95 million from the U.S. Department of Transportation’s FY 2009 appropriations and remaining money from a related FY 2008 appropriations program. In addition, money has come from the Department’s FY 2010 appropriations, which included at least $2.125 billion for high-speed rail service development programs, $245 million for individual projects and $50 million for planning and multi-state proposal activities. Click here for a complete high-speed rail project list.